This page focusses on Windows 95, 98 and ME . Configuring the PC's for use with TCP/IP is relative simple. Make sure "Obtain an IP address automatically" is checked. Click "OK" and click "OK" once more. The computer now would like to restart: do so. The configuration is done now. TIP: Sometimes the connection appears to have a problem finding the router. 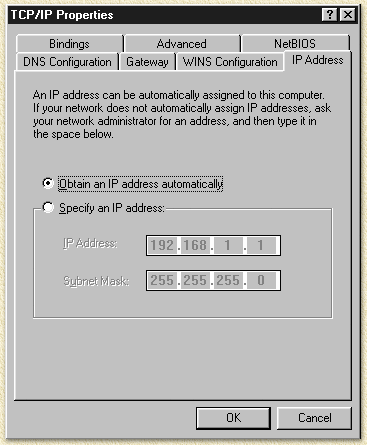 In the previous window, click "Gateway" and add a DEFAULT GATEWAY. This should be the IP-address of your router! You can verify (after the reboot) if the settings did OK, by starting the WINIPCFG application. This is done by clicking the Windows START menu. Then select the RUN option and type WINIPCFG and press enter or click 'OK'. The application now appears. 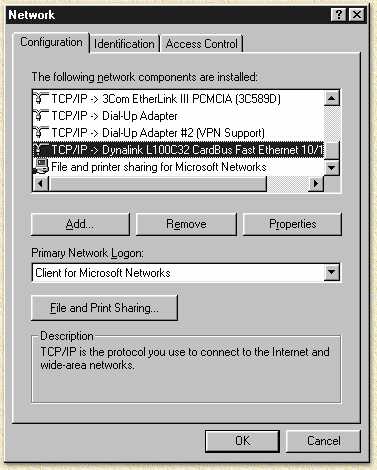 Make sure you select the proper network adapter (so: NOT the PPP connection which is selected by default).